When on Active Service committing the offence of Murder. Form for Assembly and proceedings of Field General Court Martial on Active Service. Whereas it appears to me, the undersigned, an officer in Command of 38th (Welsh) Divn. on active service, that the persons named in the annexed Schedule, and being subject to Military Law, have committed the offences in the said schedule mentioned. Lieut. Meeson 38th MGC appears as accused friend. We were on parade on 17th April at about 4pm. An order had been given for an examination of our ammunition and gas masks. The Section fell in facing the trench. Lieutenant Lloyd of our section came on parade. An order was given to front arms and Lt. Lloyd examined the section. The accused was a member of my section. While on parade I stood about 3 yards from him. I was standing in the front rank. I think the accused was also stood in the front rank. After our equipment had been examined Lt Lloyd went to the right end of the parade. Immediately Lt. Lloyd came on parade he spoke to the accused and I heard the words ‘puttees’ spoken. I saw the accused walk off parade. The accused was not on parade during the inspection. After the emergency rations had been examined and when Lt. Lloyd had walked down to the right flank I heard a shot fired and saw Lt. Lloyd on the ground. The parade broke up. Lt. Lloyd was about 8 yards from me. The parade was immediately ordered to fall in again. Just after the examination of emergency rations I saw the muzzle of a rifle sticking out of the trench to my right front. Cross Examined by accused friend. I heard a conversation when in the ranks between Lt. Lloyd and the accused. The only word I distinctly caught was “Puttees”. If there had been any high speaking from there I would have heard it. From the time I saw the rifle sticking up from the trench and the firing of the shot may have been a minute. I did not have my eyes on the rifle at the time the shot was fired. I saw no man with the rifle, I saw only the rifle. Not Cross Examined by the Prosecution. Cross Examined by the court. When we fell in the second time we fell in facing the same way. I saw blood on the ground. I saw the accused arrested. I produce a plan of the trench and parade ground at sheet 37D V15 B28. I have marked X [signed by President and attached to proceedings] The witness proceeds to explain his plan to the court. I made the plan myself. The measurements shown are accurate. From Shelter marked in red to “position of Lt. Lloyd” is 4 yards. The position of Lt. Lloyd was indicated to me and I made the measurements accordingly. The position of the section was carefully indicated to me and I made the measurement accordingly. At 3.40pm on 17th April I warned everyone to be fully dressed for parade. At 3.50pm Lt Lloyd came on parade. I fell the section in. Lt Lloyd noticed that the accused had not got his puttees on. I fell accused out and brought him in front of Lt. Lloyd. The accused was asked why he had not got puttees on. He replied that the puttees hurt his legs. Lt Lloyd dismissed him and told him to go and put his puttees on. Lt. Lloyd then carried on into the inspection of rifle ammunition for the section. After the iron rations had been inspected, the NCO inspected the front rank and I inspected the rear rank. The section was paraded in two ranks for these inspections. The accused before he was sent off parade was in the front rank. Whilst inspecting the rear rank I heard a shot. I turned around and approached Lt Lloyd on the ground but found I could do nothing for him as he was dead as far as I could tell. I looked to the right and left in front of me but I could see no one except the accused in the trench. The accused had no rifle in his hand. There was a rifle in the trench two feet away from him. It was leaning against the parapet. This rifle was not pointing in the direction of Lt. Lloyd. It was housed with the magazine attached. I did not examine it. I arrested the accused. After I had arrested the accused I looked Lt. Lloyd and I saw a bullet had entered his left temple. I placed a guard over the body and the accused. Someone handed me his rifle which was in his trench and I handed it over to the Sgt. Major. I am of the opinion that the shot came from the direction of his trench. I was with Lt. Lloyd when he spoke to the accused about his puttees. When the shot was fired my back was turned to the trench. I turned round immediately. When I turned I did not see a rifle sticking up nor did I see the accused immediately. When the accused was sent off parade to put his putties on the Rifles had not been examined. The accused came to me on at 12.30 on 17th April and asked me if he could go for a walk. I gave him permission. I am not aware accused went out shooting game. I do know that he shot a hare a week previously on coming back from work. There was no one then in his area of the trench where the accused was. The accused had his rifle on parade when he fell in for rifle inspection. The accused took his rifle off when he went for his puttees. I gave orders personally that all rifles were to be cleaned before the parade. The accused I think was not present when I ordered rifles be cleaned as he had gone out. I saw the body of Lt. Lloyd. The bullet had apparently entered the back of his head slightly above and back of his left ear. It came out somewhere near his left eye. The rifle has been in my charge since this affair occurred. I have not cleaned it at all. I did not ask the accused any questions. I have known accused for about 3 years. I don’t know if the accused has had any troubles with Lt. Lloyd. So far as I know the accused had not had any ill feeling towards Lt. Lloyd. Not Cross Examined by the Court. On 17th April about 4.10pm I was working with CSM Foster in a dugout. No. 4 section was parading about 60 yards away. I heard a shot fired. I saw a soldier falling. I went over to see what was about. When I got over I saw the accused with two sentries near him. I was asked by CSM to take the accused in hand while he searched the accused. When the search was finished I let accused’s hands go. The CSM then left with him. I stood behind Bell the accused when he said “I’ve done the section a good turn and you’ll think of Bob Bell in years to come”. The accused did not say this to me. I was standing behind him. He never said anything more in my presence. I asked no questions whatever of the accused. I did not see a shot fired. I only heard it. On 17th April I examined the body of an officer. He was dead. He had a wound to his forehead. I only had a cursory examination mainly to the fact he was dead. There was blood on the side of his head. His hair was matted and I did not examine his body minutely. Major Wood RE was present when I made the examination. At 12.30pm on 17 April 1918 I was given permission from Corporal Prior to take a walk. I went taking my rifle with me in the intention of getting a hare or a partridge, I failed to get a shot at a hare and returned to camp in order to be in time for the inspection. I went on parade and was immediately called off by the officer to put my puttees on. I went to the trench with the intention of doing so. After an interval of 10 minutes I could not find my puttees anywhere so I attempted to get out of the trench and join my section. In jumping up I tripped, the rifle flying forward and exploding immediately. I had forgotten it had a round in that I had put in during the early part of the afternoon and that was the cause of the unfortunate result. It has always been my practice to go out hunting game. In the previous week I had shot a hare and had a partridge for the officers mess. The accused has to my knowledge gone out shooting game. On several occasions he had brought game home. I saw the accused come back on April 17 he had with him a small black rabbit. The rabbit had been shot. No one actually saw the shot fired. No one heard any words between the accused and the deceased officer. No motive for his unit. Suggests it was an accident. Accused statement as to gaming not questioned by prosecution or the witness for the defence. Also the court must be convinced that this is a case of much negligence or intention to shoot the deceased before finding a verdict against accused. I submit that at the most a verdict of manslaughter can be sentenced. The accused has no evidence of character to call and states in mitigation. I am 29 years old. I have been in France since December 1915. Not married. Punishment: fined 7 days pay and last on roster for leave. If the name of the person charged is unknown, he may be described as unknown, with such addition as will identify him. Recommendation to mercy to be inserted in this column. I concur in thinking that the sentence should be carried out. The proceedings of a Field General Court Martial held for the trial of no. 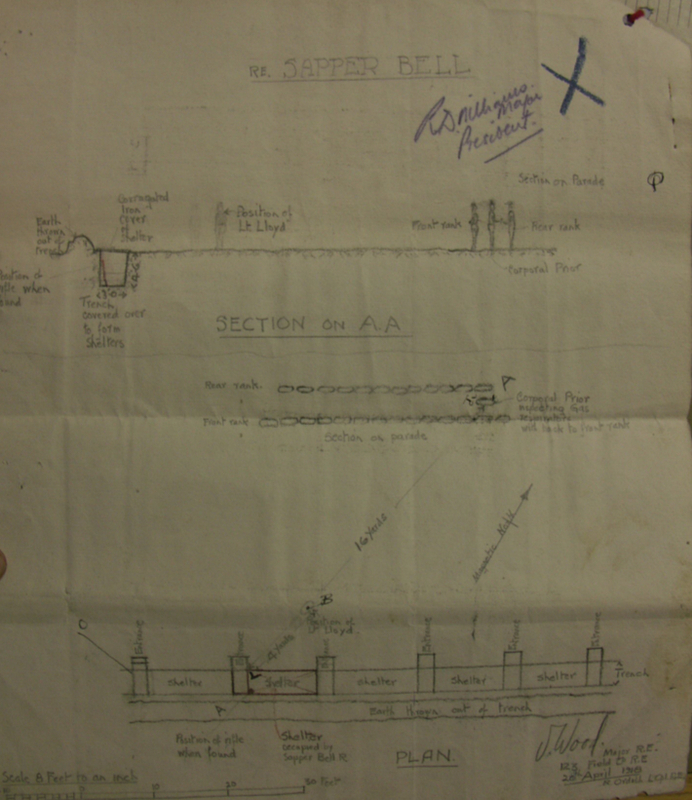 62536 Sapper R. BELL, 123rd Field Company, R.E on a charge of Murder are forwarded herewith. In confirmation of my telegram No. A (b) 67 of to-day. The return of the proceedings direct to this office after promulgation is requested. Reference your V.A.274/470 dated 18-5-18. Proceedings of F.G.C.M in the case of No. 62536, Sapper R. BELL, 123rd Field Company, R.E are returned herewith. The sentence was duly carried out at 4.12 a.m to-day, at T.15.c. , Sheet 57.D.